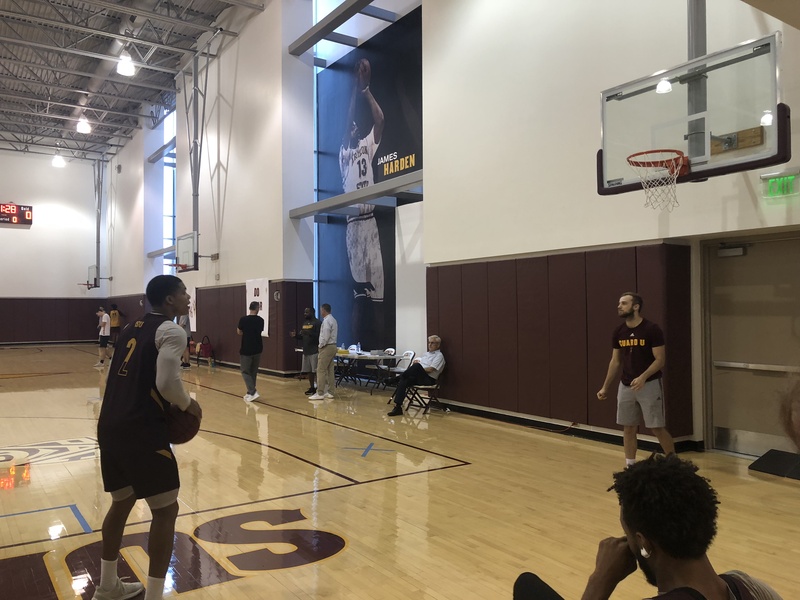 TEMPE, Ariz. — Coming off a 20-12 finish last season, Arizona State men’s basketball looks to improve in the Pac-12 with new additions Zylan Cheatham and Rob Edwards. Cheatham, who formerly played for San Diego State University, averaged 8.4 points and 5.8 rebounds in two seasons. Edwards averaged 14.4 points and 1.6 assists in two seasons at Cleveland State University. Cheatham and Edwards both announced they were transferring to play for the Sun Devils in the spring of 2017, which caused them to sit out the entirety of the 17-18 season. “I think I did a good job last year of showing guys that even though I’m not playing and suiting up, I’m going to bring it every day,” said Cheatham. Although Cheatham has never played a game for Arizona State, the Phoenix native takes pride in being one of the team’s leaders, and it is noticed by head coach Bobby Hurley. “He’s just a natural leader, he has a great approach to how he comes to work every day. Very enthusiastic and loves the game,” said Hurley. While Cheatham has already fit into his leadership role, Edwards also looks to set a great example for the younger members of the team. The Sun Devils were led last season by senior guards Tra Holder and Shannon Evans II, which helped fuel the team’s new identity as “Guard U.” Holder and Evans II have since traveled overseas to continue playing basketball, but their presence was felt by Edwards in their time on the team. “Every day those guys came in and worked hard, they did extra, and I feel like I took that from them. I do extra every day,” said Edwards. The 2017-18 Sun Devils got off to the hottest start in school history, winning the first 12 games of the season and becoming the second-ranked team in the country. After that, the Sun Devils seemed to run out of gas, finishing the season 8-10 against the Pac-12 and losing in the first round of the NCAA tournament. Hurley and his team believe a lot of improvement is in store for this season, and potentially a better finish in the Pac-12. Defense is a large focus for the Sun Devils this season, as there could see a shift from “Guard U” to “Guarding U” quickly. “We’re very defensive-minded this year. Everybody wants to win, not to say that we didn’t last year, but this year it’s a really big difference,” said Cheatham. Cheatham, Edwards and the rest of the Sun Devils will begin their 18-19 campaign at home against Cal State-Fullerton on November 6.